Ucluelet artist Justin Merk recently beautified Howler’s bowling alley with a life-sized gray whale. Justin Merk recently wrapped up a whale of a project. Feb. 22, 2016 5:00 a.m.
A local artist recently wrapped up a whale of a project. Justin Merk has boosted the ambience inside Kent Furey and Amie Shimizu’s Howler’s Family Restaurant by covering its walls with ocean-themed artwork including a life-sized 15-metre gray whale in the restaurant’s bowling alley. “This is one of the first commercial pieces I’ve done and I thank Kent and Amie for really motivating me and giving me a lot of freedom and patience to make this happen,” Merk told the Westerly. Merk said the alley’s wall was the perfect canvas for a life-sized rendering of one of the West Coast’s staple attractions and the star species of the annual Pacific Rim Whale Festival. “To see it to scale that size, being right up next to it, you really get to appreciate the animal,” he said. He hopes his art inspires the family restaurant’s patrons. “I hope it inspires families and kids that come in to take on projects of their own and dream big,” he said. He said it took about two weeks to complete the colossal whale piece, though that included a lot of late nights at the easel. “It really came together and I’ve been getting good feedback on it,” he said. Merk moved to Ucluelet about four years ago and has been enamoured with the local art scene. “As an artist it’s a great place to call home during the winter time,” he said. Having notched his first major mural project into his belt, Merk is eyeing other big projects. “I’d like to keep the momentum going; if I can get involved in more murals. Now that I’ve done a big piece, I realize I really enjoy doing large pieces and that there’s a market for it,” he said. He plans to submit an entry to the Whale Festival’s poster design contest and hopes to see other local artists take advantage of the festival’s artistic vibe. “I encourage all artists to take part in this great event; it’s a great time to get exposure,” he said. Howler’s co-owner Amie Shimizu was thrilled with Merk’s artistic infusion. 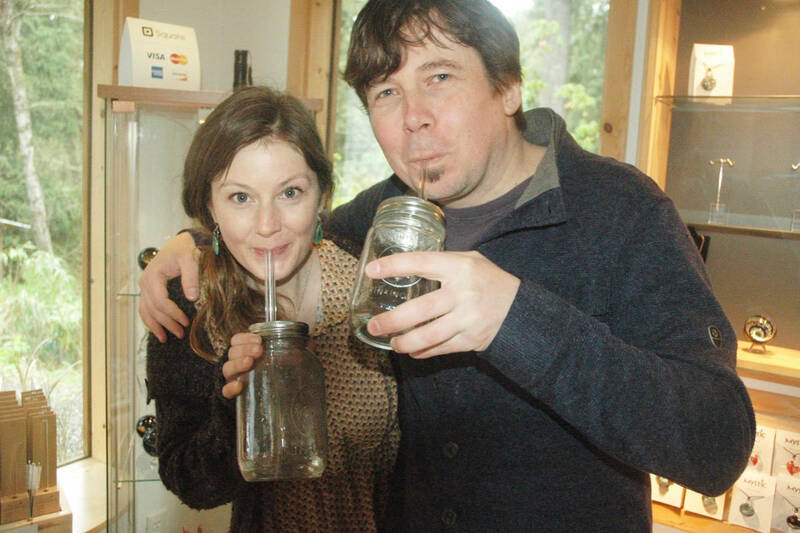 “We wanted to give to the community, and the people that come to check out Howler’s, something awesome to look at and take away from the place and something that represents Ucluelet,” she said. She was stoked to give the budding artist an opportunity to beautify her restaurant.